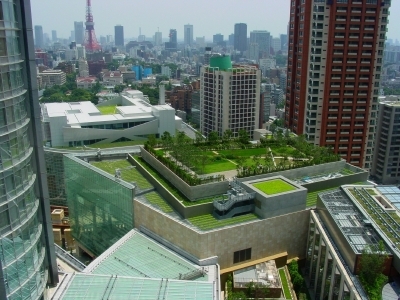 There are two main types of green roofs; an intensive roof and an extensive roof. An intensive roof is more traditional with a thicker, heavier growing medium and can support a larger variety of plants such as small trees and shrubs that have a more extensive root system. However as the name implies it is more intensive to maintain, requiring an irrigation system and regular feeding and maintenance. For this reason intensive roofs are often designed more like parks with easy access. Extensive roofs are lighter with a thinner layer of growing medium ( such as specially formulated compost.) They are designed for limited maintenance and may only require once yearly weeding and a slow release fertilizer. Provides a habitat for plants, birds and insects whose natural habitat is otherwise severely dwindling in major cities. Green roofs have been known to attract beneficial insects, birds and butterflies on buildings up to 19 stores high, and can provide a much needed stepping stone for song and migratory birds. Filters the heavy metal and pollutants out of rain water. Helps to lower urban air temperatures. It has been estimated that if all the rooftops in a major city were green there would be a drop in average temperatures in that city by roughly 7 degrease Celsius. Reduces storm water runoff which reduces the amount of water that drains into our sewage systems. In addition to that the vegetation and growing medium will act as a filter, effectively removing pollutants from the storm water and lessening the impact of the remaining runoff on our environment. Helps to insulate your building for sound. Plants block high frequencies and the soil blocks the low frequencies. A properly installed green roof can increase your roof's life span by as much as 2-3 times what it would have been according to a Penn State University green roof research center. Can increase your real estate value. According to a study conducted by Environment Canada, installing a green roof can result in a 26% reduction in cooling needs and a 26% reduction in heating costs. Reuses aggregates that would otherwise need to be removed. Aesthetically pleasing and can create a great conversation piece. Commercial properties are no longer an eye sore, as they tend to blend in more with the surrounding fauna. Psychologically beneficial. Green is a neutral and soothing color that humans have been shown to positively respond to. Will a green roof be expensive? 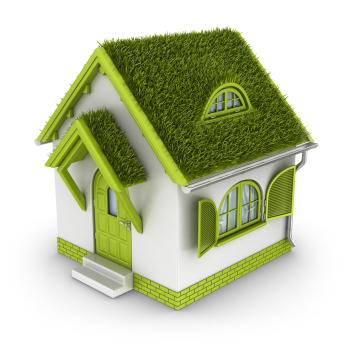 The main disadvantage to a green roof is the initial cost involved, i.e. $7-$15 a square foot for an extensive roof and $15-$25 a square foot for an intensive roof. The high cost is due to the fact that a green roof consists of many layers and must be properly and professionally installed. Go Green NY Solar is happy to help go ver these costs and help you make the best choice for your home and budget. There are many benefits to installing a green roof, including significant reductions in heating and cooling costs and increased roof life expectancy. After factoring in these and other benefits into your decision, its easy to see that the cost of installing and maintaining a green roof is considerably less than that of a traditional roof. Will a green roof hurt my existing roof? No! A green roof will prolong the life of your roof by protecting it from harmful UV light and common wear and tear from weather. The water proof membrane will protect your roof from and water leaks and damage. Is a green roof right for me? That, of course depends on your personal preferences, but when building a new property or replacing an old roof one should take a long look at green roofs, the personal and financial benefits are worth it by themselves. And when you add the environmental benefits it seems like an easy decision, with the new trend toward green living and sustainability this is a beautiful and relatively easy way to help ensure a clean world for our children and grandchildren.